Asmara, 13 November 2011- The seventh African Continental Cycling Championship which started on the 9th of November here in Asmara concluded today with Eritrea winning the championship. In today’s final road race which included a total of 14 countries covering 146 kilometers distance, Eritrean riders, Natnael Berhane and Tesfay Abraha stood first and second consecutively following a turbulent sprint. 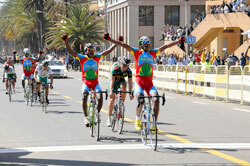 The final race today held in the presence of tens of thousands of cycling fans in the streets of Asmara was an epic event with high speed competitive atmosphere among competitors especially South Africa, Morocco and Algeria who were making unremitting escape attempts from the Eritrean cyclists. The performance of the Eritrean National Cycling Team however made Eritrea win gold and silver medals, while South African Van Rosenberg won the bronze medal. Accordingly, Eritrean racers Natnael Berhane and Tesfay Abraha took two gold and two silver medals from the elite title and under the age of 23 in the championship. From the women’s division, South African riders took the gold and silver medal, Mauritius took the bronze, while Eritrean riders Wehazit Kidane and Senait Araya stood fifth and sixth.